They did it. They actually built this course, and it is incredible. That was the consensus of our group standing on the 9th green at the new South Course at Arcadia Bluffs. That green, with its four plateaus separated by troughs and bowls, is the ninth straight mind-blower on the outward half. In front of that green is a spectacle bunker complex and several other bunkers positioned smartly to pose interesting and confounding strategic questions. Again, the ninth straight hole brilliantly and faithfully inspired by the work of C.B. Macdonald and Seth Raynor at Chicago Golf Club. Add to the spectacular architecture an easily walkable routing that changes directions on almost every hole. 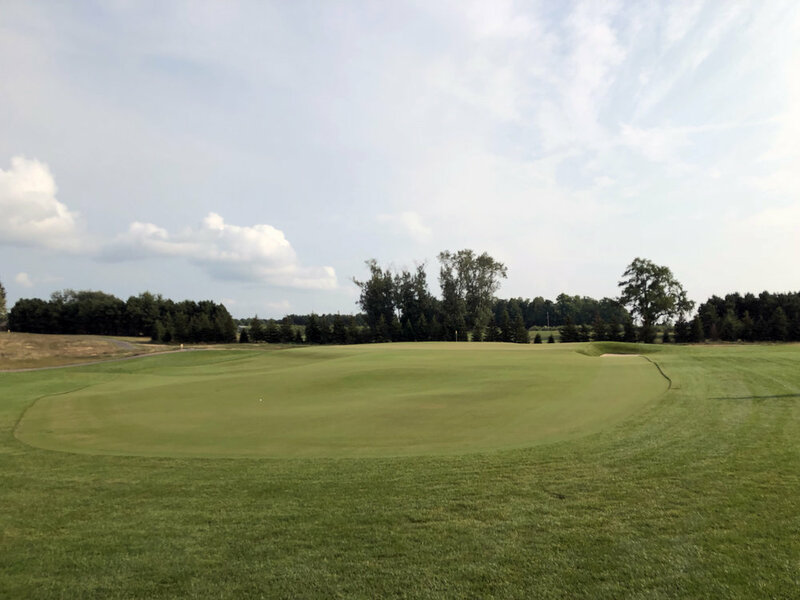 And top it all off with the perfect firm and fast conditioning achieved by Director of Agronomy Jim Bluck, course Superintendent Ryan Williams, and their team, and it isn’t hard to imagine why we were over the moon. And then the back nine happened. Before part two of this report, a little background. Northern Michigan is a favorite golf haunt of The Fried Egg. The addition of Tom Doak’s The Loop at Forest Dunes took the golf scene up there to a new level. It wasn’t just another golf course. The Loop was a creative call to arms, and we were interested to see if Arcadia Bluffs would answer. Tree clearing and earth moving on the property east of M22 was the first hint, and the news of the plan for Arcadia’s second course signaled an affirmative “game on!” Dana Fry, whose work we have enjoyed at Erin Hills, Calusa Pines, and elsewhere was charged by owner Rich Postma with studying Chicago Golf Club, distilling its stylistic and strategic brilliance, and transfering that brilliance to this piece of Northern Michigan orchard land. Neither a replica course nor a template course, the vision was to attempt to channel the inspiration gained by exposure to greatness into something new. Our interest transformed into a combination of excitement and incredulity. Would they have the chutzpah to follow through on this bold plan? Could they actually pull it off? A sneak preview walk around the course as it was growing in last year indicated that they had, and we have been eagerly awaiting the opening ever since. The 12th is a mid-length, downhill par-3 with what the resort calls a “boomerang” green. It seems to be based on the Lion’s Mouth template, and it does not work at any level. The hole strikes us as one that seemed liked a good concept, but should have been abandoned in the field. Unfortunately, they forced it, and it looks forced. Super Ryan has a near-impossible task in figuring out how to amend the grass lines so that the hole is less visually jarring. This spot on the property screams for a downhill Short like the 7th at Blue Mound. A missed opportunity. At the end of the day, 11 great holes and one clunker, excusable...moving on. This Alps-Punchbowl plays through a valley with the requisite blind shots and is spectacular from tee to green. The issue comes at the green, which looks like a green that you would find at the Bluffs course or most modern courses. It’s beautiful but a stark departure from the MacRaynor straight lines and tone that Fry-Straka set on the first 11 holes. The best way we could describe the 12-13 stretch is if you were listening to Led Zeppelin’s Physical Graffiti album and midway through the second record, Britney Spears interrupts for a couple of pop hits. Standing on the tee during the rough shaping phase of the project, we would have made big bets that this is where the Road Hole would be. The tee is on the highest point of the property, and the land gently bends left to right down the hill. What a fabulous Road Hole it would have been! Instead, the 15th is a hole lacking strategy with another green that doesn’t look like one that Seth Raynor would have ever built. The right side is littered with bunkers and there is no discernible benefit to taking them on. Blasting a drive down the left center is the right play, every day. The intention may have been for a Cape-style hole here, but we were left confused and perplexed, and not in a good way. This long par-3 would be great on a different golf course. It is terribly out of place on the South Course though, especially given that it appears that quite a bit of earth was moved to create another Britney hit, Oops I Did It Again. If a bold splash of creativity was the intent, a Redan-Biarritz combo green like the one at Quogue Field Club, but on steroids, would have made heads explode. This hole just made us scratch our heads. The church pew bunkers built into the hill on the left side of the par-4 17th are cool looking. But once again, the hole doesn’t work because of the green and it’s contrasting styles. The transition between the high left and low right tiers is overly severe. The high left tier, elevated and surrounded by bunkers, is of great concern. The greens are gloriously firm right now. With the wind blowing, that tier will be close to unhittable with any club for the average golfer. Players will howl, and likely add the temptation to water more to soften it. That would be a start down a slippery slope of overwatering that could result in a conditioning tragedy for the other great holes on the course. The back nine closes with the strong 18th which resembles a hole from the first 11 and leaves a positive taste. Given that the land is more interesting on the the back nine, it could have been even better than the front. It is not. It will be interesting to see what the ultimate verdict on the South Course will be. Like the process that created it, and the holes themselves, the answer is likely to be complex. By looking to the architectural past, it is a game changer going forward. We think that the course has more than enough challenge and interest to delight golf nerds in all the right ways. For casual golfers, it will broaden horizons and evoke a wide range of reactions, which is an endorsement in and of itself. Should you go play Arcadia Bluffs South? Absolutely. Will you want to play it again? We are intrigued to find out. We’ll certainly be repeat visitors, at the very least to more fully explore the outstanding front nine while the pure Michigan sun sets.